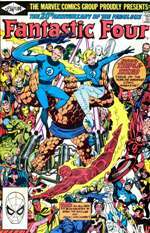 With John Byrne’s debut in July 1981, it’s somewhat appropriate that The Fantastic Four was still – just – in its teenage years. For, like a teenager, Byrne’s run on the series could be both vibrant, energetic and imaginative… yet at the same time also self-centred, angsty, indulgent and pretentious. Sometimes it’s both at the same time, sometimes it’s neither, but there’s one thing Byrne’s FF rarely is, and that’s dull. His five-year run until August 1986 represented one of – perhaps the - most critically-acclaimed and commercially successful times since Stan and Jack left the book, the FF’s sales rendering it once more one of the better-selling Marvel comics of the age. (Byrne frequently notes that, despite the acclaim, his own Alpha Flight was still selling more). With John also pencilling and inking the book then it really is a case of one man’s vision. That vision isn’t to all tastes, and sometimes his illustrations can look a little… Disneyfied. Just look at Julie Angel from #237 for a big, wide-eyed creation… that owes little to realistic anthropomorphism. On this subject, I actively dislike John’s 2-D recreation of the Thing, which, although split by him de-evolving at one stage and later being replaced by the She-Hulk, still appears for thirty issues (and one annual) and is too much of a radically different look to really sit comfortably. In the end, it’s all subjective, and despite my reservations over the depiction of Ben, Byrne shows a fine eye for layouts, movement and effective imagery, as well as covers. In terms of sales, then Spider-Man and the recently-rejuvenated Uncanny X-Men were higher in sales, but John’s run was pushing the book to a 250,000 range, some 60,000 or so extra readers since he took over. For a frame of reference, then in 2004 the average sales figure for the FF was 49,571, though in fairness, this was after the bottom fell out of the comic market and even The X-Men and Spidey weren’t cracking the 100,000 barrier. One of the canniest decisions of Byrne’s early run is the return to single-issue stories. While the 60s stories were often constrained by the format, following on so soon from a series of overlong "epics", having seven isolated, self-contained tales is refreshing. John does well with the format, too, packing in enough information so as not to make it feel perfunctory. Perhaps the main benefit to Byrne is the return to the 22-page issue format. Cost-cutting at Marvel before Jim Shooter arrived had seen the core product – the comics themselves – suffer. From January 1976 until December 1980 only nine issues had lasted longer than 17 pages (not counting the two reprint issues that the team resorted to, and the extra-length #200) and that just rising to a still-feeble 18. In fact, this pruning of the FF had really begun in earnest back in January 1974 when the average length of the issues had dropped to 19 pages. This might seem an insignificant amount, but over the course of a year that was cutting back on the equivalent of over an entire issue. Come 1976 and the average had taken a dip to 18 a month. In fact, even though the rot didn’t really start to set in until the second half of 1973, 1970 had plenty of 19-pagers making up its run. I must ashamedly confess that I hadn’t actually noticed this drastic page drop until John’s early guest stint on #220-#221, the first of which was just 16 pages. Whether this says more about my powers of observation, or more about the 70s stories that meant I didn’t miss the extra five pages a month is open to debate. To be fair, though, even the creative high of Stan and Jack was largely responsible for the format… though their first ten issues were a whopping 23 pages or more, and many that followed also took on the same length, from around issue #30 Stan and Jack had already taken to bumping out a lesser twenty pages a month. There are niggles in this first half-year of Byrne: never mind that the letters pages were talking about Sue’s new bobbed haircut more than anything else, her vast (literal) empowerment was too much, too fast, and seemed hastily contrived. Byrne gets credit for giving Sue the ability to use her forcefield as a method of propulsion, but it had already been done before, originating in a Kirby cover of the 70s. Not only that, but in trying to allude to the Lee-Kirby years too closely, we got plot developments like the Thing nearly killing Johnny (#233) like the last decade of character evolution had never happened. Redesigning the costumes and dynamics to hark back to the "golden age" is fine, but installing a "reset to zero" button as far as the characterisation went was mistreating the readers. Suddenly Ben calls Stretcho "Reed", Reed finds Ben’s sense of humour unfathomable instead of merely perplexing, and the hot-headed "will fight anyone, anytime, no matter how big" Johnny is a man with a conscience who got bullied at high school by "toughs". It’s little touches like that that do make the initial first steps a little jarring, but at the heart of these issues are decent stories, engagingly told. Many of the stories are quirky character pieces that owe more to Rod Serling than Stan Lee (August’s issue even opening with Serling’s oft-used "Case in point…" introduction for The Twilight Zone, as did Byrne's two-parter in 1980, and the Zone being referenced in #234), and sometimes don’t really feel like a Fantastic Four comic at all. Back To Basics and The Eyes Have It are mediocre, and Mission For A Dead Man is misguided, but John finally begins to hit form working on an idea from Editor Jim Salicrup with The Man With The Power. Best of all though is the 20th anniversary special, which features a Stan Lee/Jack Kirby adaptation of one of the cartoon episodes, as well as John’s first "classic" issue – the return of Doctor Doom. It appears that Doctor Doom is an almost permanent fixture of Byrne’s FF, but if you count the regular issues and annuals that John crafted over his tenure then Doom actually features in less than 19% of them. Having said this, if you wanted to be unkind you could also point out that exactly 80% of John’s run featured retreads of old characters and ideas… as nice as 1985’s Psycho-Man epic might be, it’s still just Byrne riffing on plots that date back fifteen years. What’s also notable in Byrne’s reign is that the politics of the Fantastic Four take a notable shift to the left, despite Byrne identifying himself as right of centre. Granted, with stories like "The Hate Monger" Stan Lee could hardly be accused of being from the far right either, but with John’s writing it’s often more laboured, almost preachy in tone. So that while the Thing had never been without conscience, in #232 he’s musing over the morality of disposing of elemental monsters, and later Reed would battle to save the life of Galactus. From May 1979 in John’s homeland of England Margaret Thatcher had being inaugurated as Prime Minister, a position she would hold for eleven years, the right-wing Conservative party holding office over the UK for eighteen long years. One of the most notable elements of Thatcher’s reign on the international stage was her close relationship with Ronald Reagan, the former actor/Governor of California who was appointed President of the United States in 1981. He too would instigate a long period of the right in his country, with George Bush Sr. following him to complete a dozen years of Republican rule. Together these administrations oversaw many controversial and volatile periods, including covert arms sales to Iran, attacks on Libya and, most notably, an intense cold war with the former Soviet Union. Although Byrne told me on his own forum (which is sternly copyrighted, so sadly I can’t give any exact quotes here) that he doesn’t put politics into his work, this is clearly not the case when The Man With The Power gets said power from nuclear testing on GIs and a newspaper headline is prominently seen reading ‘Reagan Says ‘‘No’’ To Talks’. To be fair to others involved, then 1981 wasn’t the exclusive domain of John Byrne. Perhaps most extraordinary is the annual, which features Steve Ditko tackling the drawing of the FF. Ditko was a leading light at Marvel in its formative years, having almost as big a rep – and bigger rows with Stan – than Jack Kirby. And he’d actually inked Kirby’s pencils for the first FF Annual with "The Fantastic Four Meet Spider-Man". Other than this one brief, six-page sojourn, though, and a cameo in Amazing Spider-Man Annual #1 the two worlds of Ditko and The Fantastic Four had failed to meet. With Ditko’s acrimonious split and creative differences with Stan Lee, when he left Marvel of his own volition in 1966 the chances of him ever working on the FF were unlikely. However, in 1979 he returned to Marvel, and spent much of the 80s working on creations like The Micronauts, Captain Universe and Rom. Ditko’s art was minimalistic at times, yet inspired, an abstract, Eastern European flavour permeating his work. Like Kirby, his style of art can be seen today as somewhat dated – albeit brilliant – and also like Kirby he could compose an exceptional cover, my favourite being The Amazing Spider-Man #33. While Ditko is arguably most famous for being the man to first bring Spider-Man to life, he also gets much critical praise for being such a strong creative talent behind the esoteric Dr. Strange, and, like Kirby, achieved some success at DC Comics. With such an impressive C.V., having a 53-year-old Ditko working on the premier foursome was an extremely enticing, mouth-watering concept. Frankly, though… it’s rubbish. Somehow the old master managed to create a work that looked like the deranged scribblings of a three-year-old with dysentery. In fact, so bad is the artwork on the 16th Fantastic Four annual that it actually makes the illustration of the year, despite being in no way typical of it. It’s a shame, because the script by Ed Hannigan is by no means awful, and is the first book to actually inspire genuine empathy with the Dragon Man. Exactly half the year also saw Moench and Sienkiewicz end their run on the title. Although often regarded as ponderous and lacking the humour of the title (a claim even made on this site in earlier versions of this article), Moench has more wit in the book than usually given credit for. Although Ben's tendency to say "babe" every other sentence to Alicia is a little difficult to get used to, he produces many humorous exchanges with the other team members, many of which are considered and not formulaic like other writers occasionally fell into. While the stories can be "dry" and sometimes wordy, Issue #228 shows Moench at his most playful, with a on-running gag about Johnny's new girlfriend appreciating the company of everyone else, and Ben repeatedly teasing him for it. Perhaps the most notable element of Moench’s run is that it transforms the Fantastic Four back into proactive explorers. I say "back", as it’s always tempting to think the idea of the FF as scientific investigators who went out looking for trouble rather than it coming to them is something more associated with the Walt Simonson period, or particularly Volume Three of the comic, where Mark Waid’s run would see them clearly identified as "Imaginauts". Yet the very first issue has Reed purposefully search out Monster Isle, while later issues (such as #19) have him return to the past to seek a cure for Alicia’s blindness. In fact, with Stan and Jack’s original vision nearly one in four of the FF stories were initiated by the group going out to the menace, rather than the menace coming to them. The actual stats show that before Doug came on to the title, 23% of the stories were caused by Reed & Co. actually investigating trouble spots. With Doug’s take on the series, it was almost half, aided by Reed getting correspondence from many previously-unseen "old friends" who worked in various research fields. As the ratings above attest, only a couple of issues really rise above average, and, while few are outright bad, they're a little too dense for what is traditionally more of a light-weight book. But in an age where every new writer wants to do their version of a "Doctor Doom - Galactus" story, it's refreshing to have such an individual take on the book. 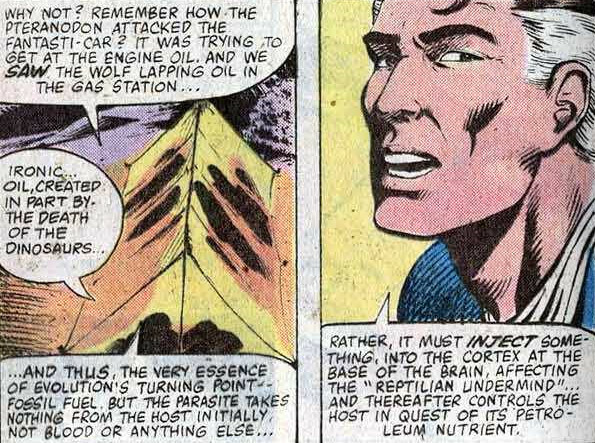 The Brain Parasites was easily Moench’s best work, a nice low-key horror story with a dreadful title. Moench’s tendency to plug his own works in the book (with cameos for Shogun Warriors and a crowbarred-in reference to Moon Knight in this year’s run) is troubling, but no more so than the group suddenly dropping Alpha Flight into conversation when John took over the reigns. The worst Moench issue came at the start of the year, with the FF battling a gigantic Samurai warrior robot in Japan, which is defeated when Reed contrivedly remembers Franklin playing David and Goliath with his toys. It’s so trite it could almost have been a script for the cartoon series that had recently been cancelled, a rarity for Moench. Trivia? In the March issue Johnny talks about getting older and references the date as "1980", while August’s had "May 19, 1981" as a letter date. Both further proof that the later concept of "Marvel time" had yet to hit the series, even if this would mean that Franklin would be at least ten by this stage. The May issue (#229) has a joke on the splash page at Jim Shooter’s expense, something that would probably be inconceivable towards the end of his reign, and the same issue also marked the return to 22 page strips in the book. Lastly, look out for Johnny, in the January issue, hoping to see the results of the Indy 500 Time Trials. As these take place in May, the comic events were happening either eight months after its broadcast, or four months before. A good year for self-contained stories, while you have to know who the Shogun Warriors are, generally there’s very little "must read" involved at all. There are references to issues like Shogun Warriors #19 & #20, The Amazing Spider-Man #157-#159 (***) and Daredevil #172 but nothing that isn’t explained in the comic itself or that really detracts if you haven’t read them.